Where people are working productively and the gears are always turning, nothing is as important as ample water for employees. 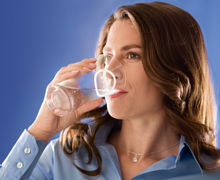 Ice cold or as a hot beverage – it's invigorating and provides a sense of well-being. But timely ordering, distribution and storage of water by the case requires complex coordination and logistics, especially in large companies. 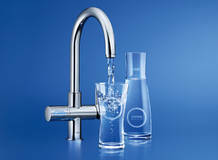 The solution: GROHE Blue® and GROHE Red®. 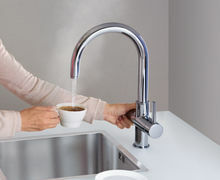 Intelligent drinking water systems in staff kitchens and on conference floors provide chilled water, still or carbonated, as well as boiling water for tea, coffee or broth. That saves time and costs, is sustainable and offers all users maximum convenience. The innovative GROHE Red® and GROHE Blue® water systems can be found more and more often in offices too, providing life's most important staple – at the perfect temperature, delicious and wholesome. A short film with examples and testimonials from well-known customers shows the advantages our systems have in everyday professional life. According to Hendrik Grempe, Head of Property Management at Vodafone, the quality, design and sustainability of the 85 water systems in Vodafone's staff kitchens speak for themselves. For Norbert Völl, Press Spokesman for The Green Dot, the deciding factor is that GROHE Red® provides boiling hot tea water for meetings especially quickly. For reasons of fire safety and energy efficiency, reducing the number of electric kettles is very important to Oliver Zimmermann, Technical Director of the Miele Forum. 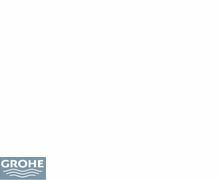 Olaf Diekmann, Chairman of the Works Council of Gerry Weber International AG, notes that GROHE Blue® makes things significantly easier for employees and provides a great deal of enjoyment. 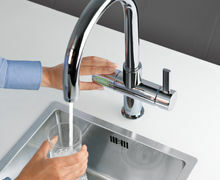 Take advantage of the enormous benefits of our professional water systems for planning your kitchen! Fresh, cooled water for the whole team? Without costly logistics for crates of bottled water? And help save the environment?Here is an innovative, stunningly simple solution: GROHE Blue® turns ordinary tap water into pure refreshment from the office’s incoming water source. Water is cooled and emerges as still, lightly sparkling or sparkling – completely according to taste. The innovative water system is fitted with a filter that is concealed under the sink and removes the heavy metals, limescale, suspended particles, chlorine and other impurities that can impair taste and odour. 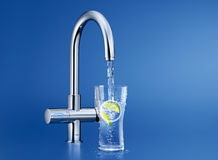 Conventional tap water simply cannot compare with the fine taste of GROHE Blue®. 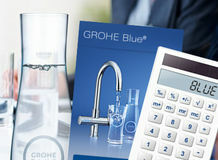 Find our more about GROHE Blue® and calculate, how much money you can save with our innovative Water Systems! 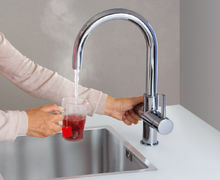 GROHE Red® provides boiling water with no waiting time. • Immediately, when you need it! • As much as is required! The innovative water system creates more order in the office kitchen. 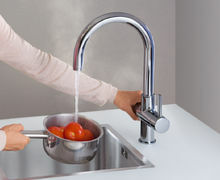 GROHE Red® consists only of the attractive fitting and a boiler which can be easily installed under any normal sink.It simplifies life and speeds up the workflow. More hot drinks are consumed in the office than anywhere else. From now on, nobody needs to wait for the kettle to boil. 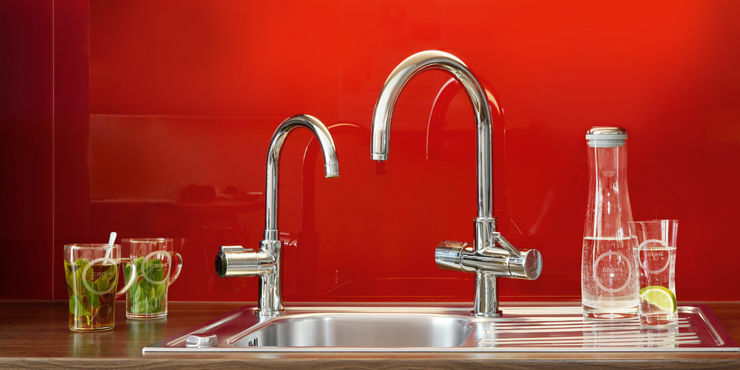 Find the GROHE Red® system that fits perfectly to your kitchen size and style - in very few simple steps. 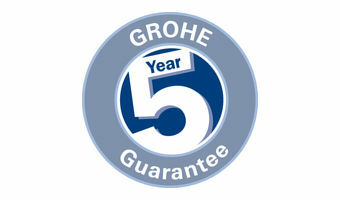 GROHE Blue® and GROHE Red® rest easy with our 5 year guarantee. You can always rely on the performance and quality of the innovative GROHE Blue® and GROHE Red® water systems. Which is why we provide a full 5 year guarantee – far in excess of the 2 year legal minimum.